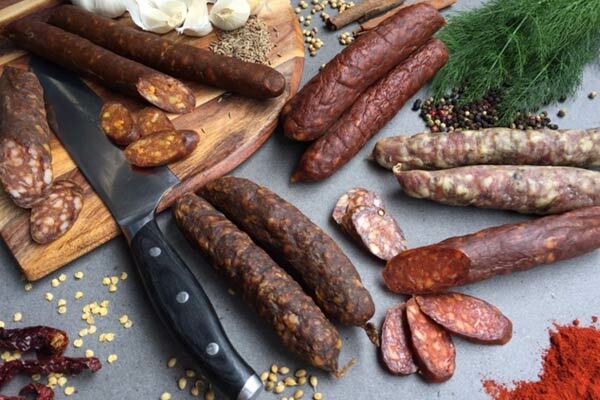 Product Care – The Hungarian Artisan Co.
You’re in the right place if you would like to know a bit more about how to care for your beautifully hand crafted salami, wood smoked and aged in the traditional Hungarian way it has been for many centuries. It has been made using New Zealand free farmed pork, no artificial ingredients, nitrates or fillers are used and it’s gluten free. We recommend storing your salami in the refrigerator for up to two months. Your salami is great for taking on hikes and camping and caravanning and can be kept at room temperature ONLY if it is able to breath. Meaning; it needs to have air circulation which keeps it dry and free from moisture, causing bacteria. If you see any WHITE mould, then don’t worry, this is ok, just wipe it off with a piece of kitchen towel. The white kind of mould is not dangerous in any way. Your salami tastes best served at room temperature. If you would like to make beautifully clean cut slices for presentation, we recommend that it is cut whilst chilled with a sharp knife. (yo~et~vodjyat) – Hungarian for – enjoy your meal!